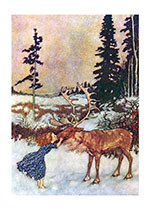 A girl kisses her reindeer friend. This charming image is from Hans Christian Andersen's The Snow Queen (1845) a fairy tale concerning the epic journey of a girl, Gerda, who must rescue her friend Kai from the Snow Queen's ice palace. French illustrator Edmund Dulac created these glorious illustrations for Anderson's classic story in 1911.